Our small group needed to catch a key train from Innsbruck, Austria to Verona, Italy, with unboxed bikes. More than a month in advance, Chris managed to computer-book himself, but not his bike. Chris later received detailed instruction for booking bike-only (NOT intuitive). (Crossing the border with bike cost an extra 12-euro, besides the 3-euro Austrian day-pass). Nikki and I also booked, but our fourth member, Greg, was subsequently unable to book his bike. His problem wasn’t crystal-clear, so he waited until we arrived in Austria. There, a staffer found that all the SIX (?) bike hooks had been booked already, with me snatching the last one. This presented a major hurdle. We conjured a Plan B, which would have Greg well behind us, missing a ride alongside Lake Garda, but reaching our Brescia accommodation the same night. BUT! See below. For one of our planned day-trips, catch a train from Innsbruck to Brenner and cruise back down, we were date-restricted by trackwork. But having found a suitable day, we could only book three bikes, with Greg again missing. Greg seemed doomed to catch a later train, and miss some of the ride. But he loitered near OUR train, just in case. There were five hooks, with my allocated position at one end. I saw a narrow space beyond mine. We quickly removed Greg’s front wheel, stood the bike on front fork and handlebar, pushed it into the space, and lashed it to mine. This worked a treat: we suspect the guard didn’t even notice. On the train to Brenner, a local recommended a rail-trail descending on the Italian side. We figured we could cruise down that trail, catch an Italian train back up to Brenner, then cruise as originally intended, down to Innsbruck. After the very enjoyable rail-trail, we found a station with no ticket vendor, nor machine, and a Brenner train imminent. The guard actually helped us clamber aboard with our bikes, which we stashed randomly. He showed no interest in whether we had tickets, much less bicycle tickets! It was on that train that we talked with two riders returning from Verona to Munich. They were riding a series of local trains with their bikes because they would have to have booked bike positions SIX MONTHS in advance on a long-haul train for their popular route, popular time. For one of our planned day-trips, train to St Anton and cruise back down, most possible days were unavailable for bike-bearing. Substitute buses were being used because of ROADWORK! I think a bridge-span was being positioned above the rail-line. Anyway, we DID manage to find ONE bike-bearing day that suited, and all went well. Emboldened by our success with smuggling Greg’s bike up to Brenner, Greg loitered with us again for OUR train, while still expecting to implement Plan B (later train). Our train had a single bike hook at both carriage ends. But again, there seemed enough space adjacent to MY hook and we pulled the same stunt. This time, Greg’s bike, standing on fork and handlebar, was recessed so obscurely that we’re sure the guard didn’t notice! This was one of many “exciting” journeys with bikes on regional Italian trains when NOT boarding at the train’s start point. The bike-bearing section is at the back of the train, except when it’s at the front! And except when it’s/they’re in between! Rather than a bike symbol on the carriage-side, there were often two large white arcs. Platform positioning and running-like-maniacs was “challenging”, especially when the platform was full and the train was fuller! In some cases, the bike-bearing section was ignored, and one did whatever-it-takes to get self, bike and panniers(?) aboard. Fortunately, Italians generally are VERY sympathetic to cyclists. There were six of us for a short bike-bearing Italian train-ride to optimize our ride around Lake Lugarno, with the complication that the train went into Switzerland awhile, then back into Italy! We bought Italian bike day-tickets, of course. But, our train was cancelled! We followed other people to another train but it took us only across the border to Chiasso, Switzerland. So now, here we were waiting on a Swiss platform without Swiss bike tickets (half-fare or SF20 day-pass). A senior staffer had helped us the previous day, and she seemed to smooth the way for us again. (No sign of Cadel as the train passed through Stabio). This was the bubble-wrap adventure I documented in a Leader’s Lowdown on 26.09.18. The planned bike-bearing train for part of the journey no longer ran, perhaps because of the collapse months earlier of a large bridge on to rail-tracks near Genoa Station. A staffer was adamant that no bike-bearing train combo was now possible. In summary, we partially disasembled our bikes on the platform and wrapped most of each frame in bubble-wrap, with (reversed) handlebars showing. On a Milan-to-Nice express, we loaded them at the end of a carriage’s seating area, before suitcases were placed aside them and before a conductor noticed. STRESS CITY! Later, the conductor grumbled, but we and the bikes survived. At Nice, we reassembled the bikes on the platform, discarded the bubble-wrap, and caught a bike-bearing regional train to Cannes. Ian Meller once bubble-wrapped similarly, because his posted-ahead bike-bag never came. Two of us disembarked with bikes at Avignon, from a train stopping briefly before going further. We watched bemused as a group of at least eight pannier-bearing cyclists struggled to reach the correct door, then struggled to get bikes, panniers and themselves aboard. This train was had two large steps from platform to train-floor. We knew there were only three bike hooks, and one was still occupied when we left. It really reinforced to us that train-tripping with bikes in a larger group is fraught. Within eastern France, my pre-planned sequence of bike-bearing trains north was no longer available. I tortuously figured a Plan B involving 4 trains over 26 hours to Strasbourg, with an overnight stop after three trains in an uninteresting town. I KNEW bikes couldn’t be taken on TGVs in Provence, and my apps confirmed that. With spare time in Arles Station two days beforehand, I asked a staffer if she could improve on my plan. After many minutes on her keyboard, she said I could take the bike on a TGV from Avignon to Strasbourg in 5 hours! I needed to work through the ramifications of this Plan C and returned to book later. The only staffer then was a man, who went ballistic at the very idea of taking a bike on a TGV. My pleas, that his colleague had said I could, mattered little. I begged and begged him to check. When he found she’d been right, he didn’t apologize: just sulked as he issued my ticket. On a Saturday, I caught a morning regional train from Nuremberg towards Munich, alighting at Ingolstadt for a day-ride along the Danube. The train had huge bicycle images on its sides, showing where to board with a bike. The train became very crowded with revellers en route to Oktoberfest (aka Septemberfest). Someone moved my bike away from the fold-down seats to a place where it was stable but not impacting passengers. The next day, I waited to board the same train, with panniers, on my way to my Munich hosts, to Oktoberfest with them. But a guard spotted me before boarding and told me that, despite the huge bicycle signage, I couldn’t catch that train because of expected Oktoberfest crowds. My plea that I could store the bike without impact did no good. In early planning in Australia, Chris booked his ticket from Como through Switzerland to Munich (for his flight home), but couldn’t figure how to book the bike. While in Italy, Chris had been frustrated with aspects of Italian trains (cancelled, late, crowded, announcement-overload, staff, …). To be more confident about taking his bike to Munich, he made a very short return train trip from Como to Chiasso, in Switzerland, where he enjoyed helpful advice and bike-booking. Greg subsequently took the opposite route to Munich, retracing via Verona and Innsbruck. He was unable to book the bike beyond Brenner(o), so disassembled it on the platform there, bubble-wrapped it, and loaded into a luggage section on the train to Munich. He saw several empty bike positions nearby, some of which had no pre-booked tag and which remained empty to Munich! I have recently proven that Italy’s online ticketing facility has serious weaknesses re international journeys. Greg might well have been OK had he booked with Germany’s “DB Navigator” app. Tom knew the allowed dimensions of luggage on his TGV train and knew his bike-box length, 1.5M, was 0.3M over. He was unable to place the box in luggage area racks, so it was in a passageway (as was other luggage). While underway, the conductor tracked down the culprit, and caustically told Tom it wasn’t a freight train and that he and box could be ejected. Tom acted the ignorant, contrite tourist and managed to stay aboard until Paris. If intending much train-tripping, keep your group small: four at most? Plan, plan, plan, but expect the plan to sometimes go awry. 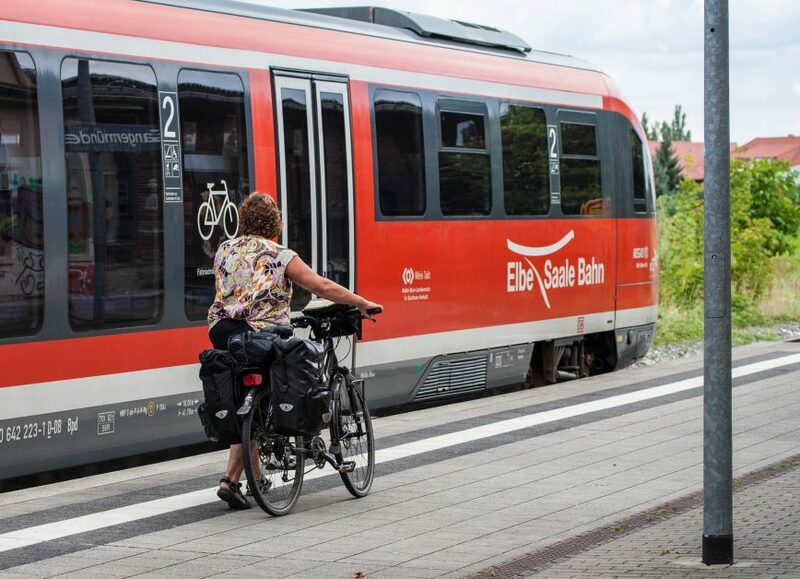 For train trips that matter, book your bike as many months ahead as possible. Stay alert and agile, especially for Italian regional trains. For cross-border travel, consider cycling across border to maximize options and save money. Bubble-wrap at a train’s start station, and disassemble/wrap/stow as clandestinely as possible. What’s possible/disallowed so often comes down to individual staff, and even your approach.